The event was created to encourage collaboration and discussion between scientists and residents about the lake and its future. Speakers included members of the Maine Department of Inland Fisheries and Wildlife, the Portland Water District, the Lakes Environmental Association and Lake Stewards of Maine. The 135 attendees chose from a variety of sessions. The symposium at Saint Joseph’s College was hosted by the Saint Joseph’s Center for Sustainable Communities and the Portland Water District. In some ways, there was cause for celebration. The water district’s Brie Holme said the lake is one of the cleanest in Maine. Its low phosphorus level, which is a good sign, has not risen for decades. But Sebago Lake has begun to show signs of change, Holme added, including its surface water temperature and development in its watershed. As Lesher put it, “the lake is the integrator of its watershed.” What is happening in the surrounding area is “summarized in Sebago Lake,” she said. Despite the many marker’s of the lake’s good health, “the future of the lake really is to be determined,” Lesher said. Mary Jewett of the Lakes Environmental Association and Roberta Hill, invasive species program director for the Lake Stewards of Maine, discussed the threat of invasive species in the lake, from milfoil and zebra mussels to Asian clams and hydrilla. One of the best ways attendees can help prevent the spread of those species, they said, is through visual boat inspections. As Hill explained, humans are the primary means invasive species use to move from lake to lake, and cleaning, draining and drying a boat before moving it from one water body to another is the first line of defense against invasive species. Hill also urged listeners to “know what is suspicious” and keep an eye out for invasive species when they’re on the lake. “Early detection saves lakes and lake communities from ecologic and economic disaster,” she said, and surveying Sebago Lake is difficult due to its size. 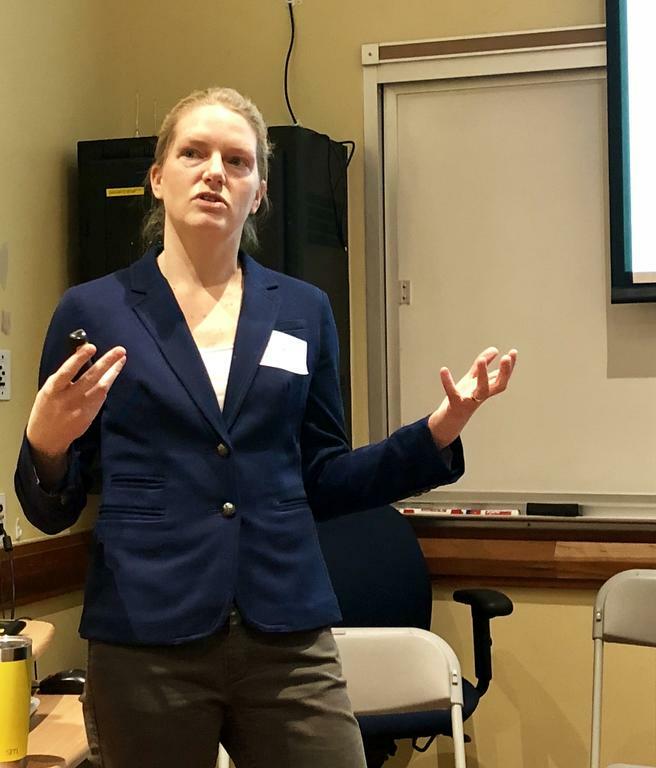 During her talk, Dr. Jessie Meeks of Bates College described the impacts that climate change will have on Maine’s lakes, including increased precipitation, stronger storms and more droughts, which will result in degrading water quality and loss of water sources. Sen. Bill Diamond, D-Windham, spoke about the importance of awareness in the community and advised attendees to maintain natural vegetation on their property and have their septic systems inspected. “If we maintain forests around lakes, they will be cleaner and more resilient,” he said. Kirsten Ness of the Portland Water District agreed, advising attendees to incorporate shrubs on their properties to help offset development. Rather than look to the future, Jim Pellerin, Regional Fishery Biologist for the Sebago Lake Region of the Maine Department of Inland Fisheries and Wildlife, returned to the past for his presentation. He gave a history of fishery management in the lake, including the introduction of lake trout from 1972-1982 at the request of residents. The fish quickly became self-sustaining and are now competing with the native salmon population for resources. The symposium was Lesher’s brainchild, along with Holme, Ryan Dorland of Saint Joseph’s Department of Natural Science and Nina Eduljee, a psychology professor at Saint Joseph’s. They used grant funding to buy a monitoring buoy in 2017, which was installed in the lake and monitors dissolved oxygen and temperature. The planning began in June, when the steering committee reached out to a variety of organizations, residents and businesses around the lake to gather their input and began inviting speakers. Lesher said she has received positive feedback about the symposium and would like to hold the event again. “I was excited for attendees to learn about the monitoring buoy and just learn that there’s some really great science going on. All these different groups are trying to learn more about Sebago Lake and really all of us have the goal of sustaining it into the future and supporting the variety of uses that it has,” she said. Jane Vaughan can be reached at 780-9103 or at jvaughan@keepmecurrent.com. Dr. Jessie Meeks of Bates College discusses how climate change will adversely affect Sebago Lake. From left, Paul Hunt, Kirsten Ness and Roberta Hill participate in a roundtable discussion at the symposium Feb. 2.